The special edition LXP bottle will be on my girlfriends' makeup shelves well into the New Year. Finding the perfect gifts for our nearest and dearest is never an easy task, but when it comes to choosing gifts for her loved ones, Hollywood star and SK-II ambassador Cate Blanchett prefers to give something close to her own heart – a special gift that will truly last the test of time. 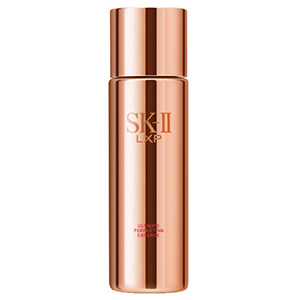 As a loyal SK-II user for 11 years, the stunning Cate is particularly fond of the ultra-luxurious LXP Ultimate Perfecting series. These masterpieces of SK-II are the epitome of luxury skincare, exclusively containing the highest concentrated Pitera™ and resulting in skin that is remarkably radiant and smooth. “The LXP Ultimate Perfecting Essence has become my number one product, not only because the packaging is gorgeous but the quality is so remarkable that a little goes a long way,” says Cate. Especially for this year's festive season, the LXP Ultimate Perfecting Essence receives its own deluxe version that’s undoubtedly high on Cate’s shopping list. The exclusive 215 ml “Special Edition”-inscribed bottle is available for a limited time only, making it an ideal gift for the discerning woman who deserves only the very best. After all, what’s better than the gift of everlasting beauty? LXP Ultimate Perfecting Essence is my number one product.